KYPipe has been developing and supporting pipe system hydraulic flow analysis software for over 40 years. PIPE2012 is the most widely used pipe system hydraulic flow analysis software in the world. The strength and flexibility of PIPE2012 has made KYPipe an industry leader and the sophisticated algorithms used to analyze Steady State, Surge, Gas and Steam systems have been endorsed by leading experts in this field. KYPipe has recognized the value of ARI’s Dynamic Air Valve to effectively prevent surge conditions in a pipeline. The ARI D070 air valve is now modeled within the KYPipe software for designers to use in their pipeline systems. ARI is an innovative designer and manufacturer of pipeline air management products being used by municipalities and industries around the world. ARI would like to thank KYPipe for their endorsement! ARI is represented in Canada by Martech. If you would like a demonstration of how ARI’s air valves manage the air in a pipeline, please send an inquiry to the Martech’s technical sales team. What do you get with air in your pipes? I recently visited a small town in Saskatchewan with air in its water pipes. The Water & Sewer Operator told me his big clunky cast iron air valves weren’t working – air wasn’t able to leave (or enter) the water system because the valves weren’t performing like they were supposed to. He asked for help in finding a valve that would perform correctly. I showed them the ARI D-040 combination air release / vacuum valve. Plastic, lightweight, modern and simple to install and maintain. The Waterworks Operator was very intrigued. The day after I left, he ordered two D-040 ARI air valves from his local distributor to try on his distribution pumps. After installing his two valves, he got instant results. 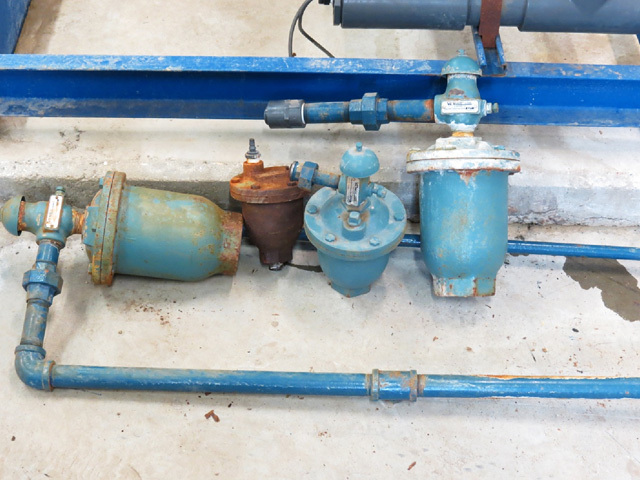 He was so impressed at the ease of installation and the immediate results that he went back to the distributor and ordered six more D-040 air valves to replace all the defective valves currently installed in their water distribution pumphouse. Original air valves gave awful performance. These cast iron valves have been uninstalled and are ready for scrap. When I visited a couple of weeks later to ask how things were going with the new ARI air valves, he told me he could not be happier. The D-040 air valves were easy to install and were performing perfectly, something he was not used to. Before, he had to bang on air valves with a hammer to loosen up the internal mechanical valve components enough to give minimal performance. (You can see some hammer marks on the old valves.) He stated that residents in the town were getting air coming out of their kitchen taps as a result of the air valves not working properly. Now he says he can hear the valves working when he is in the pumphouse. He has installed four new ARI D-040 valves on his distribution pumps and one D-040 each on the transfer pump, filter unit, back wash pump and on the pre-filter. Flow rates have improved and the “air coming out of the kitchen taps” problem has gone. ARI D-040 combination air release / vacuum valve installed after water distribution pump in Saskatchewan. Second D-040 air valve installed in small town Saskatchewan pumphouse. To see high resolution photos of this installation and a testimonial from the town’s Waterworks Operator, contact a Martech representative and we will forward the project details to you within one business day. Combination air release/vacuum valves release air from the line when filling and allowing air to reenter the line when draining. In the spring of each year, melting water from Edmonton’s snow storage and melting sites flows into pipelines that drain to the North Saskatchewan River. Installing air valves on these pipelines is necessary for optimal flow and efficient pump operation. Managing the flow of water from Edmonton’s new northeast snow storage site was a problem that design engineers and project managers knew how to handle. The 12 km pipeline from the snow storage site to the nearest storm drainage main required air release/vacuum valves to function properly. They specified the ARI’s modern D-020 air valve for the pipeline. Older pipeline designs specified a “long body” air valve traditionally used with potable water, not raw water or wastewater. The long body air valves were being rendered inoperable by dirt and grime floating in the melting snow water. The non-functioning long body air valves were allowing air to be trapped in the pipeline which slowed the flow of water. Not good! The long body shape does not provide much room between the float and valve walls, making it very easy for dirt and grime to render the float immobile. ARI’s family of air valves for wastewater solve this problem by using a bell-shaped conical design to keep the float away from the sides of the valve wall. TRADITIONAL AIR VALVE (left): Long body shape does not provide clearance between the float and valve walls, making it very easy for dirt and grime to render the float immobile. The top ball-plug and bottom ball float are connected by a rigid stick, which increases the probability of eventual damage to the port and seal when the ball is repeatedly smashed up during turbulent operation. ARI D020 AIR VALVE (right): specially designed to operate with liquids carrying solid particles such as wastewater and effluent. The bell-body shape provides extra room to prevent the ball float from becoming clogged and the sloped wall also prevents the grease from clinging to the wall. The top seal and bottom ball float are connected by a spring, which eliminates the chance of damage from turbulence. In a turbulence situation, any movement of the traditional air valve’s float causes an equal movement of the ball-plug. As turbulence bounces the float, the ball-plug bounces too. As the plug bounces, more and more air escapes, dwindling the air pocket. In the turbulence within the air valve, dirt is splashed up to the sealing mechanism and orifice seal, causing leakage and damages. ARI air valves are a highly reliable solution for drinking water, raw water and waste water. The design engineers and Roadways Maintenance team selected the ARI D020 air valve for its reliability and long term performance capabilities. For a detailed profile of this project (including 17 high quality photos showing the installation of one of the D-020 self-contained, direct-bury air valves), please contact us for more information. Shale gas is natural gas trapped within shale rock formations deep underground. Part of the gas extraction process is the hydraulic fracturing (fracking) of the shale rock. The water/sand/chemical mixture used to fracture the shale is so corrosive, it can deteriorate stainless steel. Keeping the inflow and outflow lines functional and safe is a primary concern when a fracking operation is underway. Engineers designing shale gas extraction sites need to ensure that the line performs optimally while reducing the chance of environmental issues. With the risk of corrosive fluid deteriorating air valves, how can an engineer size and locate air valves on inflow water and outflow frac water lines? After consulting with shale gas extraction design engineers, ARI and Martech have developed a high pressure industrial air release valve using Duplex Stainless Steel that is designed to function in this corrosive environment. ARI’s avCad software has been updated to support the engineer’s use of this new air valve. To ensure the line achieves optimal performance, project engineers use the ARI avCad design program to determine where air release valves should be placed on the line and which model and size valve will work best. Thanks to Martech and ARI, engineers now have a functioning solution to manage the flow of corrosive liquids. Contact your Martech Infrastructure Sales Representative and ask where ARI air release valves, ARI avCad software and your Martech technical representative can support your pipeline projects. Manholes have high construction costs and maintenance costs. The typical traditional manhole for an air valve costs around $15,000 each. Maintenance in this manhole will requires confined space entry, which necessitates a 3-person crew and a service truck costing $500 to 1000 per maintenance trip. In a new water supply pipeline project in 2011, a municipality in Central Alberta saved the cost of building and maintaining a manhole for every single air valve. They used the ARI D-090 direct-bury self-contained air valve kits to install air valves on the line without manholes. Using the ARI D-090 direct-bury self-contained air valve removes the need for a manhole chamber. The compact and lightweight air valve design saves time and installation costs for the contractors: the initial cost of a D-090 (including installation) is about $8000. We saved capital costs for the owner and engineers, lowered the installation costs for contractors, and drastically reduced maintenance costs for the pipeline operators. Total savings: $7000 x 100 air valves = $700,000 in two years for Alberta Central East (ACE) projects. In 2011, we saved more than half million dollars in project capital costs for Urban System and the ACE. Our people met and trained the contractors to make the installation easier and faster. The savings in each air valve maintenance trip is more than $500 (no confined space access costs!). The total maintenance cost saving is $500 x 100 air valves x 20 years = $1,000,000 (and this is based on a conservative estimate). Using the ARI D-090 air valves is saving this Alberta municipality more than $1.7 million in capital and maintenance costs. Martech’s Derek Traquair brought ARI Air Valve’s Joel Sheinfeld from Israel to Strathmore to review the air release valves used on the East Calgary Regional Water Line and the Strathmore Water and Sewer System. Jason Dastou, Epcor site manager, was appreciative for the training visit. They covered maintenance of the ARI D-060 and other ARI air release valves in the Epcor Strathmore system during Joel’s visit. ARI D-023 combination air-release and vacuum air valve on wastewater transfer line in Alberta. Martech is Canada’s master distributor of ARI air release and combination air valves. Municipalities and water service utilities use air valves on their pipelines to add or release air to the flow in the pipe. Having the right amount of air in the line prevents collapse, air-blocked lines and leaking. As ARI Air Valve’s North American Sales Manager, Joel travels extensively to conduct training seminars and sales meetings for cities, contractors, distributors and end users. Thank you Joel for making Calgary and Strathmore a priority this season! Based on a track record of delivering on performance promises, A.R.I. combination air valves were once again specified for a new sewer forcemain by the City of Airdrie, Alberta. A forcemain is a pressurized main pipe that can carry water or sewage. To achieve optimal performance from these critical pipelines, city infrastructure departments use air release and combination air valves on their forcemains. The Airdrie Public Works Department first learned of A.R.I. air valves in 2003 when they were looking to replace the traditional combination air valves on the 350 mm 200 PSI water line connecting them to Calgary, several kilometers away. The existing 50 mm diameter air valves were corroded and cumbersome to work with in the chamber. Local representatives at Martech introduced Dave Johnson and his crew to the advantages of the superior solution offered by the A.R.I. D-040 combination air valve. The A.R.I. air valve is NSF61 certified, 1/10th the weight of the existing valve, has a five year warranty and expels 4 times as much operational air. These features topped with a competitive price piqued Mr. Johnson’s interest and nine D-040 air valves were installed. To date, the A.R.I. air release valves have worked flawlessly in unheated insulated chambers when surface temperatures have dipped to -37°C. This experience prompted the city to install A.R.I. air valves on the existing sewage forcemain to Calgary. A.R.I. model D-025 combination sewage air valves were selected for the existing 600 mm diameter forcemain. Although some of the valves were exposed to some grease plugging, as all air valves are, city crews found the light weight and ease of flushing to be a significant improvement over the original products. Although cleaning the A.R.I. air valves was easy to do on site, the city was quick to adopt A.R.I.’s suggestion to back-flush the air valves into the forcemain from surface with hot water. This modification was environmentally sound, simplified cleaning procedures, successfully minimized the need for confined space access and reduced costs. In 2004, the city retained BSEI Engineering to design a new twin 600 mm diameter forcemain to handle Airdrie’s explosive growth (population 30,000 and still growing fast). BSEI engineers and the city maintenance team worked together closely to take full advantage of the experience with A.R.I. air release valves. The new chambers employ A.R.I. D-020 stainless steel air valves. The exhaust from each air valve is hard piped to the surface for venting and for remote attachment of back flush equipment. Isolating valves can also be operated from the surface. Once again, the A.R.I. air valves minimize or eliminate expensive confined space access! The new forcemain will be commissioned in the next few months, once the pump station is completed. A.R.I. and Martech appreciate the innovative spirit and cooperation extended to us by the City of Airdrie Public Works Deptartment and BSEI Engineering. Martech is a professional contracted sales company. Our job is to drive sales and create advantage for our customers. Joel and Noa recorded this message to recognize the value Martech has delivered to their manufacturing company and to our local customers and partners in our Canadian territory. Martech is searching for new manufacturers to drive strategic sales with in Canada. Please use the “Request Info” form on the right side of the page to start a conversation with us about your sales needs.